Here's something no one really considers: Fancy Bags (Also known as "show bags"). 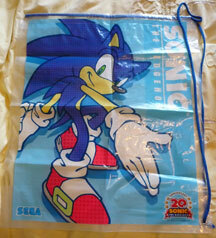 In the US, (and I would assume most other Sonic producing countries) bags are just something to get your stuff home in, except for a few rare occaisions such as conventions, pre-orders & etc. 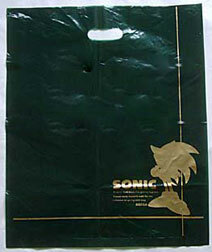 Japan, however, seems to have a different view on bags so you'll see a lot more Sonic packaging from there. This page, however, is for bags from ALL countries. 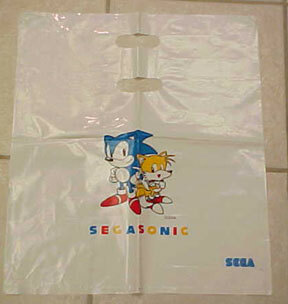 This can also include slip covers, wrappers that may OR may not contain Sonic things. They can be from any store or promotion. 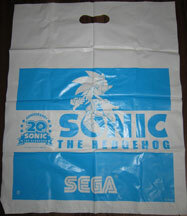 What more could you ask for...A Sonic item inside a Sonic bag! A thin plastic bag with loop handles on the top. These were sent to me never actually used. How does one aquire a bag without having something to put in it? It has an interesting 'fade' effect going on for the Sonic art, the fade gets darker until the last one is a full color picture of him. 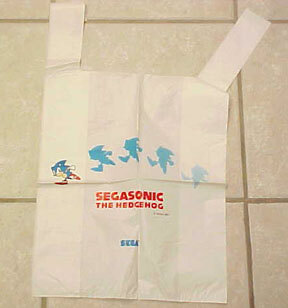 Note the "Segasonic" branding here, that means that it was an early 90s item. Item is in the SonicGear Personal Collection. Christmas shopping or a Christmas present itself...? 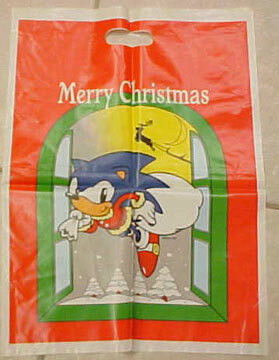 Here's a rare Christmas themed Sonic bag. Was it some kind of store offer to get shoppers in time for the holidays? 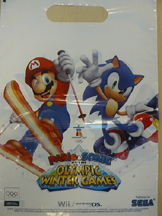 It has an unusual art of classic Sonic dressed in a Santa Claus type suit, with bag of toys. He's shown entering through a window (better than a chimney, maybe?) Look at the single reindeer pulling the sleigh outside...it's empty. This bag could be aquired somewhere in Japan. 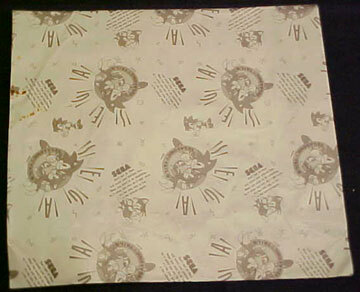 This is a flat slip bag for placing thin books, comics or magazines inside of. There is also an identical one where the graphics are in light blue instead of sepia, as shown here. The quote on the bag says "Don't just sit there and waste your precious time. When you want to do something, do it when you can. Do it right away. It's the only way to live a life without regrets." This is a great quote as said by Sonic the Hedgehog. It appears on many Sonic products throughout Japan. It is quite sad that other countries didn't adopt it. They come in 'standard' sizes, probably one to fit a book, and another to fit a small variety of magazines. Item is in the SonicGear Personal Collection. A simplistic 2 handle-hole bag. The handle placement like that (1 on top of the other) is sort of unusual...was it supposed to make the bag sturdier somehow? The plastic of this one is rather sturdy/thick. This one also showcases the use of the combo-word "Segasonic" which was popular in the early days of Sonic the Hedgehog fame in Japan. 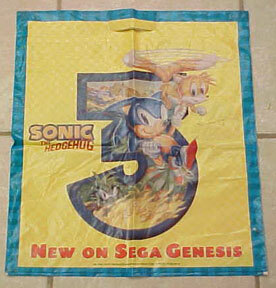 This was most likely used to keep him closely associated with Sega and not just the Genesis or Megadrive. It was abandoned later. Item is in the SonicGear Personal Collection. This is the only one from the USA in the SonicGear Personal Collection. I won it in a tri-state video game championship. It was used to carry home the prizes. It may have also been a pre-order prize for Sonic 3 in certain stores. It's creative in its design, using the box art from Sonic 3, but placing it inside a large 3, then having various elements coming off the edges of the number. 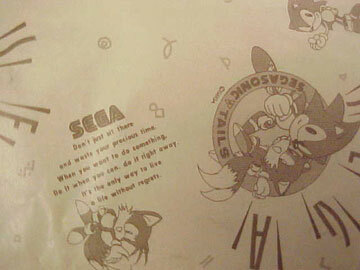 The whole 'background' portion is checkered in blue & yellow while the slogan says "New on Sega Genesis". This stuff would be so cool if you could actually BUY it. I think part of the appeal of Japanese items is that there is often so much detail in everything. Packages are actually cool. Stuff is not covered in "MAX'S HOUSE O' JUNK" so that you throw it out the second you get it home. It's far more memorable to have something that reflects the interest of the buyer AS WELL AS the store or company, rather then trying to wave only the boring store name at everyone. Chances are, they'll keep the interesting item that came with their purchase, even if it's 'co sponsored' with the store. Anniversary event they held there. 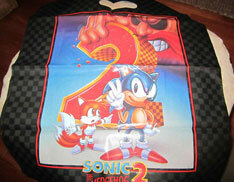 It has the 20th Logo, Sega logo, modern Sonic & logo, all in just blue ink. 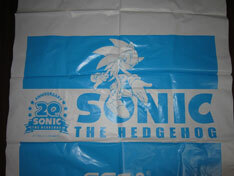 Sonic is an outline, and he works well, overlayed with the rectangles & print logo. The last bag is pretty much the same as the middle one, only it's larger/the biggest bag of the selection here. This bag is rather sophisticated & simple in style. It's black, with only gold ink for the color. 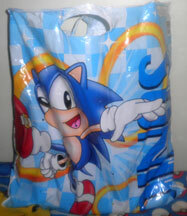 It has a sihlouette of modern Sonic, with the logo, and some words. A gold line runs vertically & horizontally along the edge of the bag. This is supposed to be from 1998, was it for SA1? What do the tiny words say? Here are 2 different show bags from 1996. Each is white, with tall straps at its edges. 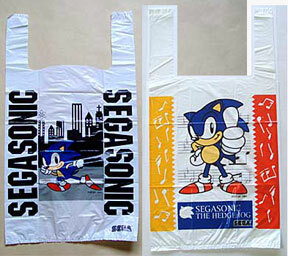 The first bag has Sonic running in front of a city sihlouette with "Segasonic" spelled up and down the sides. The right side bag has a musical theme. It has scattered music notes on the red & yellow borders. Pointing (or thumbs up?) big hand Sonic is standing in front of 3 strips of music note chart lines. 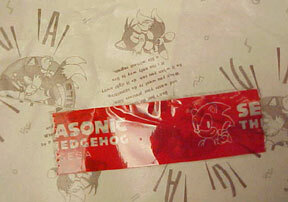 The bottom has a blue rectangle with "Segasonic the Hedgehog" and the Sega logo. Both bags feature non standard / not stock art, which is fairly unusual. Was the musical themed bag released with a sound track CD?